It has to be said that if you don’t put a little effort into your Paleo eating plan, you can end up eating the same thing over and over again. And with our crazy 21st century lifestyles, it can sometimes be a challenge to ensure that our lunch offerings are tasty, interesting, varied and, of course, Paleo friendly. But fear not, because here are 5 great Paleo lunch ideas that will give you that much-needed boost in the middle of the day. Whisk the eggs, sea salt, pepper, and basil together in a bowl. Set aside. Place the butter or avocado oil to the pan, add the green onions, spinach, and bell pepper. Sauté until spinach turns bright green and begins to wilt (should take less than a minute). Reduce heat to medium, add egg mixture. Stir thoroughly. Sprinkle feta cheese on the top. Leave to cook untouched for 5-6 minutes. When the egg mixture begins to set at the edges, transfer to the oven for 10-12 minutes. Enjoy hot, or refrigerate (will last around 3-4 days), and take to work for a delicious cold lunch, or reheat if preferred. At only 350 calories but with a whopping 38 grams of protein, this makes for one power packed lunch. The following makes 2 servings. Add beans to a pot of boiling water – cook for approx. 2 minutes until bright green and crispy-tender. Drain and plunge into ice water, drain and set aside. 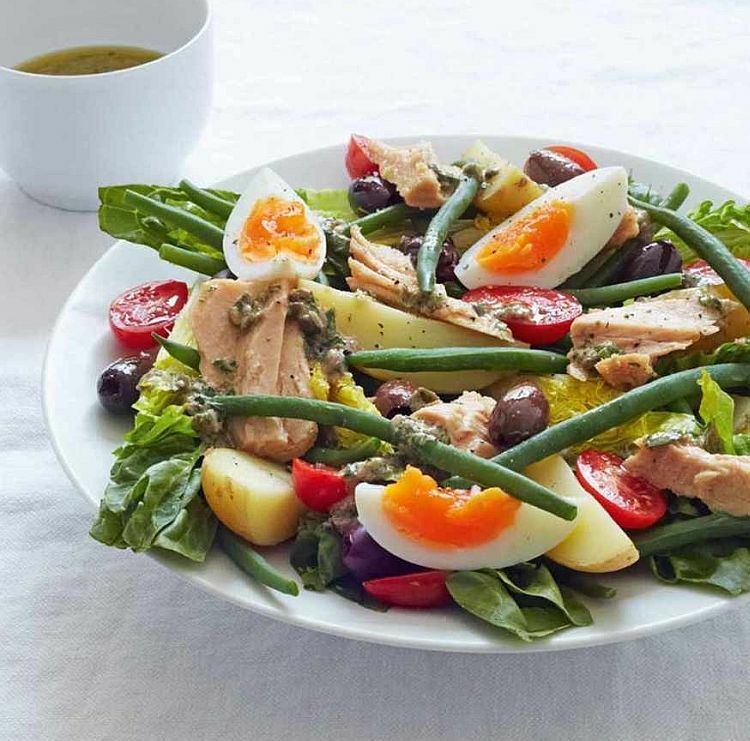 Arrange the lettuce, basil, tomatoes, onion, cucumber, radish, eggs, and green beans between 2 plates. Heat a large non-stick skillet over a medium-high heat. Coat with cooking spray. Sprinkle the tuna with salt and pepper, add to pan and cook until browned on the outside and pink inside – approx. 2 minutes each side. Cut the tuna thinly across the grain and place on the salad. Combine lemon juice and the rest of the ingredients in a small jar with lid and shake. Drizzle over the salads. This baby takes only 15 minutes to prepare and can be enjoyed hot or cold. Combine all the Cajun seasoning ingredients in a bowl and toss with the shrimp. Place the noodles in a bowl, top with the garlic Cajun shrimp and vegetable mixture. Put the almond meal, salt, and mixed seeds in a blender and mix until coarse and crumble. Place to one side. Place the sausage meat, spices, and pepper in blender, mix until combined and sticky. Divide the sausage meat into 6 balls. Create a ‘cup’ with each in the palm of your hand and place an egg in the middle. Work the mixture around the egg so it completely covers it. Dip the ball in the egg mix. Delicious hot or cold, and wonderful with chutney, rocket, and avocado. The following serves 4, so you can make at the weekend and freeze some for a later date. Melt some cooking fat in large saucepan over a medium heat. Add the garlic, onion, carrots, and celery. Cook until tender – approx. 5 minutes. Stir in the cauliflower, cook for approx. 5 minutes, stirring occasionally. Bring to the boil, reduce heat and simmer for around 15 minutes. Season to taste. Garnish with the bacon and fresh dill.